Long post today! First, want to publicly acknowledge the gift of poet Amy Ludwig VanDerwater, who gave 20 very full minutes of her precious time to two classes of 2nd graders yesterday via Zoom. 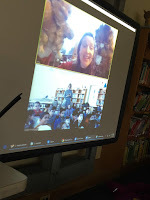 Thanks to the dedicated efforts of my media specialist, @JoelaPaik, the technology worked beautifully and those kids are marked by the blessing of her poetry and her personhood forever. Thanks, Amy! Last Poetry Friday in Room 203 was a day with more gorgeous than bitter (it always is). 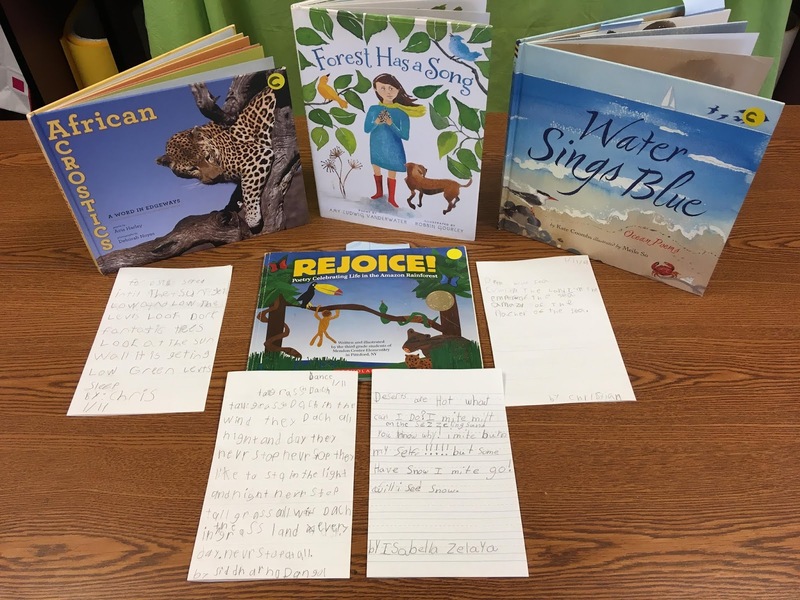 Again this year (see past projects 2017 here and here 2018), after quite some time spent researching and writing informational brochures about a range of world habitats, the Diamond Miners enjoyed some inspiration from the books pictured below as well as FOOTPRINTS ON THE ROOF by Marilyn Singer, and then set to work. As always there were a couple who had trouble getting started--but only a couple and only a little! Most kids understood that they were going to use all the knowledge they had accumulated through research to inform a poem and went to work with very definite ideas. 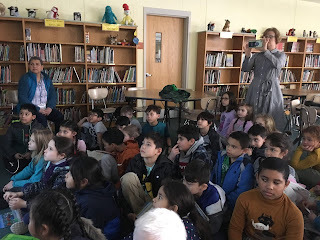 And as always, I consider it evidence that my Poetry Friday routines are effective that every kid felt able to strike out on their own to act as "the boss of their poem." I find that Poetry, in contrast to its bad rep for making people feel dumb and inadequate, Is Empowering for kids. A gila in the desert? And expanding in the forests? Savannah? Have you seen habitats? And now, here are the students' poems! have snow. I might go! day never stop at all. Day after day it is hot. Every monster can be dangerous. See if you can touch one? Ringing on houses for prey. There is not much rain. But why? You need to know!!! You can look at a book. Fine, but where’s the computer? Water rippling shiny & blue. Ocean splashing fiercely on shore. The roundup today is with Tricia at the Miss Rumphius Effect. Let us mourn and rejoice together. Empowered Poets here!! Their group acrostic is terrific, and I love those sleeping leaves, relaxing rivers, dancing grasses, and tickling prickling hot winds. Nice work! They obviously know a lot about habitats AND poetry. This is the Diamond Miners typing. Thank you for your support! We love to read positive comments from everyone. Talented kiddos, Heidi, can't wait to see what they come up with next! Each poem had such lovely noticings. These are amazing, Heidi. I'm not surprised, though, considering you are their guiding light. Projects like this make me wish I was back in the classroom. Looking forward to seeing their illustrations, too! Thank you for sharing the Mary Oliver poem, too. That last stanza is stunning. Your students' poems delight me. They speak of deep research as well as the individual voices of the children. 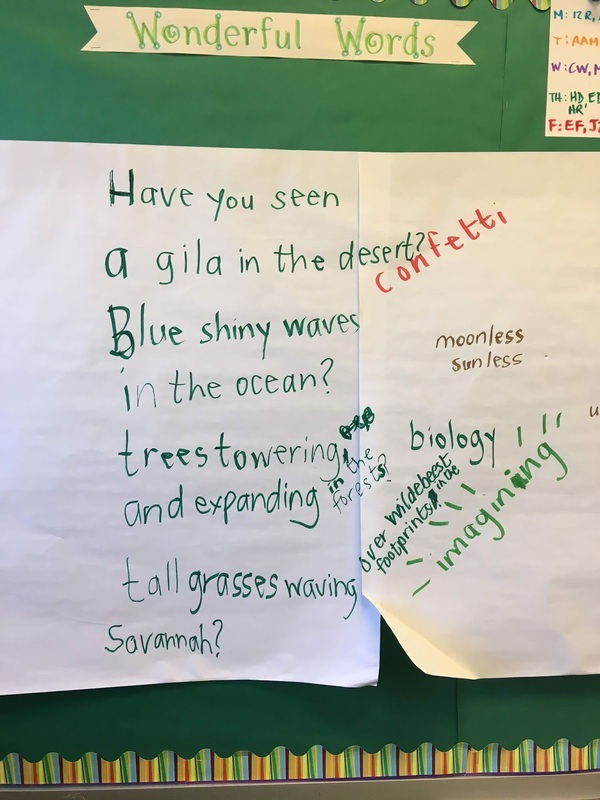 Diamond Miners, your poems are flat out AMAZING! If this is what you are creating now, I can't wait to see what beauty you will bring into the world with your words in the years to come! Lead Poet, this line made tears spring into my eyes (still sliding down my face, in fact): "I believe she would have enjoyed these poems by 7- and 8-year olds, and certainly, through me, their voices are influenced by hers." Mary Oliver is not truly gone. It must be our mission, through our own teaching and writing, to make sure her voice and spirit never die. Your students are incredible writers! I could imagine the voice of each one as I read. Also, I really enjoyed the Mary Oliver poem you shared. I am always in awe of her gentle words. Wow -- these are awesome, Heidi! I especially like Corwin's thunderstorm poem because I could visualize that ant hill on the savanna. What a wonderful group of poems and what a terrific way for your poets to showcase all they had learned about habitats! I'm so glad you shared these here. Diamond Miners, your work is so impressive. I'm applauding you in this response. I love your descriptions of habitats. "as tall as a zebra's belly" might just be my new favorite unit of measurement. Just look at how much your words are like the poet, Mary Oliver. You are part of the great community of poets....such a tresure for all of us. Diamond Miners, your poetry showcases all your noticing, wondering, and research. Your voices are strong and unique, even when you wrote about the same topic. Congratulations on putting your ideas together to raise your voices as young poets. Diamond Miners your voices are powerful and you really helped me see and feel these habitats. Keep sharing your voice in any and every form.